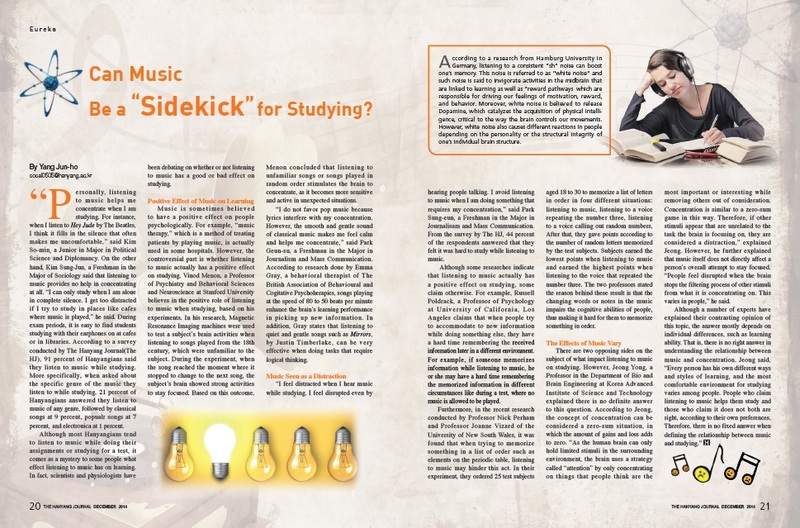 Can Music Be a "Sidekick" for Studying? “Personally, listening to music helps me concentrate when I am studying. For instance, when I listen to Hey Jude by The Beatles, I think it fills in the silence that often makes me uncomfortable,” said Kim So-min, a Junior in Major in Political Science and Diplomancy. On the other hand, Kim Sung-Jun, a Freshman in the Major of Sociology said that listening to music provides no help in concentrating at all. “I can only study when I am alone in complete silence. I get too distracted if I try to study in places like cafes where music is played,” he said. During exam periods, it is easy to find students studying with their earphones on at cafes or in libraries. According to a survey conducted by The Hanyang Journal(The HJ), 91 percent of Hanyangians said they listen to music while studying. More specifically, when asked about the specific genre of the music they listen to while studying, 21 percent of Hanyangians answered they listen to music of any genre, followed by classical songs at 9 percent, popualr songs at 7 percent, and electronica at 1 percent. Although most Hanyangians tend to listen to music while doing their assignments or studying for a test, it comes as a mystery to some people what effect listening to music has on learning. In fact, scientists and physiologists have been debating on whether or not listening to music has a good or bad effect on studying. Music is sometimes believed to have a positive effect on people psychologically. For example, “music therapy,” which is a method of treating patients by playing music, is actually used in some hospitals. However, the controversial part is whether listening to music actually has a positive effect on studying. Vinod Menon, a Professor of Psychiatry and Behavioral Sciences and Neuroscience at Stanford University believes in the positive role of listening to music when studying, based on his experiments. In his research, Magnetic Resonance Imaging machines were used to test a subject’s brain activities when listening to songs played from the 18th century, which were unfamiliar to the subject. During the experiment, when the song reached the moment where it stopped to change to the next song, the subject’s brain showed strong activities to stay focused. Based on this outcome, Menon concluded that listening to unfamiliar songs or songs played in random order stimulates the brain to concentrate, as it becomes more sensitive and active in unexpected situations. “I do not favor pop music because lyrics interfere with my concentration. However, the smooth and gentle sound of classical music makes me feel calm and helps me concentrate,” said Park Geun-su, a Freshman in the Major in Journalism and Mass Communication. According to research done by Emma Gray, a behavioral therapist of The British Association of Behavioural and Cogitative Psychoherapies, songs playing at the speed of 80 to 50 beats per minute enhance the brain’s learning performance in picking up new information. In addition, Gray states that listening to quiet and gentle songs such as Mirrors, by Justin Timberlake, can be very effective when doing tasks that require logical thinking. “I feel distracted when I hear music while studying. I feel disrupted even by hearing people talking. I avoid listening to music when I am doing something that requires my concentration,” said Park Sung-eun, a Freshman in the Major in Journalisam and Mass Communication. From the survey by The HJ, 44 percent of the respondents answered that they felt it was hard to study while listening to music. Although some researches indicate that listening to music actually has a positive effect on studying, some claim otherwise. For example, Russell Poldrack, a Professor of Psychology at University of California, Los Angeles claims that when people try to accommodate to new information while doing something else, they have a hard time remembering the received information later in a different environment. For example, if someone memorizes information while listening to music, he or she may have a hard time remembering the memorized information in different circumstances like during a test, where no music is allowed to be played. Furthermore, in the recent research conducted by Professor Nick Perham and Professor Joanne Vizard of the University of New South Wales, it was found that when trying to memorize something in a list of order such as elements on the periodic table, listening to music may hinder this act. In their experiment, they ordered 25 test subjects aged 18 to 30 to memorize a list of letters in order in four different situations: listening to music, listening to a voice repeating the number three, listening to a voice calling out random numbers, After that, they gave points according to the number of random letters memorized by the test subjects. Subjects earned the lowest points when listening to music and earned the highest points when listening to the voice that repeated the number three. The two professors stated the reason behind these result is that the changing words or notes in the music impairs the cognitive abilities of people, thus making it hard for them to memorize something in order. There are two opposing sides on the subject of what impact listening to music on studying. However, Jeong Yong, a Professor in the Department of Bio and Brain Engineering at Korea Advanced Institute of Science and Technology explained there is no definite answer to this question. According to Jeong, the concept of concentration can be considered a zero-sum situation, in which the amount of gains and loss adds to zero. “As the human brain can only hold limited stimuli in the surrounding environment, the brain uses a strategy called “attention” by only concentrating on things that people think are the most important or interesting while removing others out of consideration. Concentration is similar to a zero-sum game in this way. Therefore, if other stimuli appear that are unrelated to the task the brain is focusing on, they are considered a distraction,” explained Jeong. However, he further explained that music itself does not directly affect a person’s overall attempt to stay focused. “People feel disrupted when the brain stops the filtering process of other stimuli from what it is concentrating on. This varies in people,” he said.